A great city like Madrid, full of life, with people who live there and tourists from all over the world, full of events and activities, deserves to be visited, the best way to do it is by AVE and forget about traffic jams and of paying for parking, because parking in Madrid is not for free, or long waits to travel to Madrid by plane. 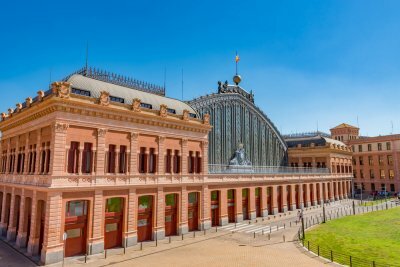 The two main AVE stations in Madrid are the station of AVE Madrid Atocha which is the station that links AVE trains with the south of Spain and part of the north as the route until Barcelona and the station of AVE Madrid Chamartin which is the station that links AVE Madrid with north and north-west Spain. There is a metro connection between them therefore the link between the two AVE stations in Madrid is really good. Madrid is a town that offers thousands of opportunities to tourists, there are events, activities and places for all types of travellers. And the AVE offers you the possibility of accessing Madrid with the cheapest AVE Madrid tickets that you will find on our website through our search engine for AVE Madrid cheap tickets. Both the centre of Madrid and its surroundings are an appropriate tourist destination for any trip, more or less long, alone or in company and at any time of the year. Start your trip to Madrid by travelling at the best price for your AVE Madrid tickets, and stroll through one of the most famous and broadcast places in Spain, Puerta del Sol, where you will also find two other points of great tourist interest, the Bear and the Strawberry Tree and the plaque marking the Kilometre Zero. Within walking distance from the Puerta del Sol we will enjoy the Royal Palace and the Plaza Mayor in Madrid. The most famous street of the Spanish capital is another place to visit, the Gran Vía, with the most important theatres of the capital. It is also indispensable to visit the most popular park in Spain, the Retiro. If you go by AVE to Madrid, visit also the Puerta de Alcalá and the Cibeles fountain. The most popular religious building in Madrid is the Almudena Cathedral, 69 meters high and 102 meters in length. It has different architectural styles such as the neoclassical, neogothic and neo-romanesque styles, located in the heart of Madrid and opposite to the Royal Palace. More recent but also very interesting to visit are the Cuatro Torres, the highest skyscrapers of our country, which are 250 meters high. Visit the neighbourhood of la Latina and have some "tapas" , and if you visit this district on Sunday or on a public holiday, take a walk along "el Rastro" , full of street markets and thousands of people who visit it looking for some curiosity or bargain. Take a walk around the Montaña Park and appreciate the Egyptian monument Temple of Debod, built stone by stone in the 70s, it is an Egyptian temple that was ceded to Spain in 1968. To admire this monument at sunset is an unforgettable experience. What is more, at night in the summer there are usually cultural events. Beyond the centre of Madrid, we can also take advantage of our cheap AVE Madrid tickets to visit the periphery of the capital. At only 50 kilometres from the centre of Madrid we have San Lorenzo de El Escorial, the most visited town in Madrid after the capital itself. Visit also the Monastery of San Lorenzo de El Escorial, the Eighth Wonder of the World and a World Heritage Site. We can also take advantage of our visit by AVE to Madrid to enjoy another World Heritage monument, the Palace of Aranjuez and its Gardens of Aranjuez. If you like cultural visits, take advantage of the money you have saved in your trip with the cheap AVE Madrid tickets and visit El Pardo Royal Palace, the Prado Museum, the Reina Sofía Museum and/or the Thyssen-Bornemisza Museum. The Madrid Puerta de Atocha railway station is located within the railway complex of Atocha Madrid, located near the Plaza del Emperor Carlos V, a very central area of ? ?the Spanish capital. The station was built between 1985 and 1992, just behind the Atocha station. The setting up of the Madrid Atocha railway station coincided with the setting up of the first AVE, the High Speed ? ?line linking the cities of Madrid and Seville inaugurated in 1992. At the end of the years 2000 a series of renovations were realized in the railway station of Madrid Atocha with the aim of increasing its capacity because over the years the number of travelers who used it, mainly users of the high speed lines, did not stop increasing. The railway station has all kinds of services that travelers may need, such as toilets, cafeterias and restaurants, ATMs, parking, National Police station, lockers, shops, tourist information, bookstore or pick up service of online tickets. It also has services adapted for people with disabilities, as well as the Dialoga service, for deaf or hearing impaired people. The location of the Madrid Atocha railway station is magnificent. It is very close to some of the major attractions of the city of Madrid, so if you have time, you can take advantage to know something more about the capital of Spain. Parque del Retiro, for example, is very close to the train station. This historic garden and keeps a rich heritage, especially the Monument to Alfonso XII, the Crystal Palace, the Great Pond, the Parterre, the Gate of Felipe IV and the Royal Astronomical Observatory. Very close to the Retiro Park, specifically on the Paseo del Prado, there is the Botanical Garden, the Thyssen Museum and the Prado Museum, we highly recommended to visit them. The Reina Sofía Museum is also nearby, with its permanent exhibition and many other temporary exhibitions that are changing throughout the year. 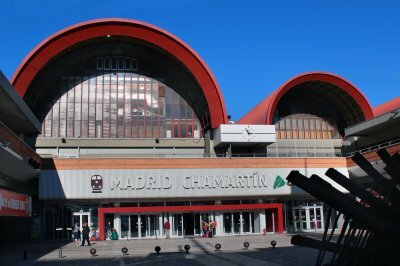 The railway station of Madrid Chamartín is located in the northern part of the capital of Spain, specifically in the district of its same name. At the beginning, this station, which was somewhat more south than the current station, had as one of its objectives during the Second Republic, the connection with the station of Atocha and the works began in the 30s, when a communication plan was developed between the stations of the south and the north area of Madrid, but it was stopped by the Civil War. At last, in 1967 the tunnel was opened that united the station of Atocha with the station of Chamartín, and the last one begins to provide travelling service. The traffic of the station began to grow, and its then twelve routes, began to be scarce, so in 1972 its expansion and modernization was approved. The works of the new station began at the beginning of the year 1973. The first phase was finished at the beginning of the year 1975, at this moment the station counted on 21 tracks, almost double that in its origins. Over the years, cinemas, discos, bars and restaurants, skating rinks, shops, gyms, car parks and even a hotel, which was inaugurated in 1982, were constructed next to the station. During the 1980s, there were a lot of changes in the Spanish railway network, with the Chamartín train station being the main train station in Madrid and in 1986 when the Atocha train station was closed to accommodate the High Speed ? ?train station, Chamartín was the only one left in the whole capital. However, when the new station of Puerta de Atocha was inaugurated, Chamartín returned to be in the background. This railway station of Madrid Chamartín is the second most important station of the city of Madrid, it plays a vital role, since it is in charge of connecting the AVE with the north of the peninsula. The station has all the necessary services such as toilets, cafeteria and restaurants, luggage racks, parking, post office, banking services, car rental, luggage storage, tourist information or hotel. It also has services adapted for people with disabilities. Another point in favor of the railway station of Chamartín is that it is very well located, and there are a lot of interesting places in its vicinity, such as the Four Towers of Madrid, one of the most modern areas of the city. It is also very close to the National Archaeological Museum, the most important at national level as far as archeology is concerned. Chamartin railway station is also very close to some of the most representative monuments of the city of Madrid, such as the Puerta de Alcalá, Plaza de Cibeles or Plaza España. Also, from the train station of Chamartín it is very easy to move to another point of the city, since it is very well connected with other transports in the station itself. The name AVE, Spanish High Speed ? ?, began to be used in 1992, when the first high-speed line was put into service, which was the line connecting the city of Madrid with the city of Seville. This service was inaugurated the 21st of April in 1992 and supposed a great revolution for the rail network of Spain. The high-speed line Madrid Sevilla was the first to connect the capital with southern Spain, but over the years many other lines were put into service, connecting the city of Madrid with various points of Spain's geography. Throughout the year 1997 the construction of the high speed line that would unite the cities of Madrid, Saragossa, Barcelona and the French border was started. In 2003, the section connecting the city of Madrid with the cities of Zaragoza and Lleida was put into service. At the end of the same year the Huesca high-speed line was also inaugurated, thanks to which traveling to the Pyrenees became much easier. In 2005 the high-speed line between Madrid and Toledo was put into service, using part of the Madrid-Sevilla high-speed line. In 2007, the line connecting the city of Madrid with the Andalusian cities of Cordoba and Malaga was launched, a key line for users looking for sun and beach holidays, as the Costa del Sol is one of the most desired destinations by both national and international tourists. In turn, the high-speed line linking Madrid with Valladolid was also put into service. The AVE is part of our history. It isnt only a reliable, fast and comfortable means of transport, but it has been with us since 1992. The city of Madrid is very well connected with the rest of towns in Spain. This success is due to the AVE. Traveling with the AVE for a fantastic price is possible. You can travel at very affordable prices and the whole process is very easy, from booking and buying tickets to the destination. You're going to save yourself the queues we're exposed to when traveling by plane. In addition, the train stations are usually very central and accessible. Also, the AVE has a punctuality rate of almost 100% and delays are very rare. The seats in the AVE are very comfortable and these are reclining. The trip is a pleasure full of advantages. You can rest, read, listen to music, watch a movie or have a drink in the cafeteria service. The Atocha station has an impressive main facade. The station is in the centre of the city. Once inside, everything is architectural and decorative surprises. A clear example is the tropical garden in the lobby where the rails were previously found. Now the user can enjoy a trip beyond the tracks, you can wait for your train surrounded by vegetation, as there are numerous plants of different species. You will not find only plants there, but also exotic wildlife, especially, Florida turtles. A few meters away there are restaurants and fast food services. The Puerta de Atocha station receives many high-speed trains that have Madrid as the beginning and end of the journey. The most popular lines are Madrid - Seville, Madrid - Valencia and Madrid - Barcelona. We are going to go back in the history of the station of Atocha, since its remodelling has an interesting development. No doubt, the result of these changes has been good and it is now a symbol of the railroad success. Its construction began in the nineteenth century and was inaugurated in 1851 by the railway company MZA or Railroad Company of Madrid to Zaragoza and Alicante. The inauguration was not just a simple inauguration, illustrious personages of Spain attended the event and a trip from Madrid to Aranjuez was realized with a very special passenger: the Queen Isabel II. Over the years, the number of passengers was increasing due to the growth of the rail network. Because of this, it was necessary to build more than one building. Between 1985 and 1992 Rafael Moneo directed the enlargement works. First, a building was built to host the high-speed line. It was located just after the original station. Secondly, Atocha Cercanías, for trains that connect with the south and east of Madrid. A space for a Metro station was also enabled, whose stop was renamed Atocha Renfe. The original station remained standing but the tracks were eliminated. They decided to give it a different use. However, much of the construction remained intact. The station was very large for the time in which it was built, in 1892. The director of the works was Alberto de Palacio Elissagne, a collaborator of Gustave Eiffel. We see, as in the works of Eiffel, the delicate use of wrought iron which is boldly and resistant at the same time. Instead the area where the tracks were was converted into a wild space: a giant greenhouse that would serve as a lobby to access the stations. In this large tropical garden you can observe different types of plants and animals. Getting to Madrid by AVE allows you to start the visit immediately, either for leisure or for business, when leaving the station you will find the Plaza de Neptuno and the Botanical Garden. A few steps away you will start the Paseo del Prado where you will find some of the most important museums in the world, such as the Prado Museum, famous for its collection of pictorial works. You can admire paintings by Rubens, Tiziano, Murillo, Zurbarán, Rafael, etc. In this museum we notice once again the presence of the Spanish architect who remodelled the Atocha station, Rafael Moneo. This talented architect was in charge of the expansion of the museum in 2007. How is the Prado Museum different from other museums? Many works of the collection that contain this museum were works created by order (normally by Kings who liked the art). The art works are intense. No work will leave you indifferent. The well-known triangle of art in Madrid is made up of the Museo del Prado, the Thyssen-Bornemisza Museum and the Reina Sofía National Art Centre. The first is a collection of private art collected over several decades, seven, by the Thyssen-Bornemisza family. In the museum you can admire works from the European Renaissance or Impressionism artists and also from US artists like Roy Lichtenstein. The second stands out mainly for its collection of works of art by 20th century Spanish artists such as Picasso, Dalí and Miró. Apart from the interesting museums, Madrid is a city where you can stroll and you will be seeing different monuments and architectural works. For example, you can walk along the Gran Vía, see the theatres and have a coffee in one of the bars along the way. 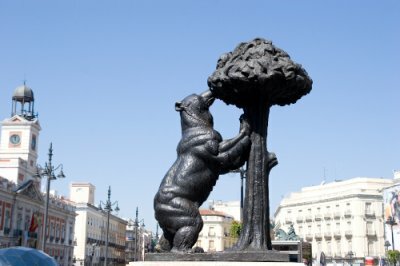 Some key points to see are the Puerta del Sol, where you will find El Oso y el Madroño and Kilómetro Cero, Plaza Mayor, Puerta de Alcalá and the popular Parque de Madrid el Retiro. A little more hidden but still near the centre is the Temple of Debod. This temple was a gift from Egypt to Spain as a symbol of gratitude for the help given to save the Nubian temples. It is worth visiting the temple at sunset. Also, from there, you will get nice views of the city. If you also want to go shopping, Madrid opens up a large range of possibilities. In Gran Via there are shops for all public and in Sol and in the neighbourhood of Salamanca you will find a more luxurious type of boutiques. You can also visit El Rastro, although only open on Sundays and holidays, which is an open-air market with a very good atmosphere in the Latina neighbourhood.